The farm system of the New York Yankees just got a little more crowded. The trade of Aroldis Chapman brought back Adam Warren plus three Minor League players, including two of the top five prospects from the Chicago Cubs. 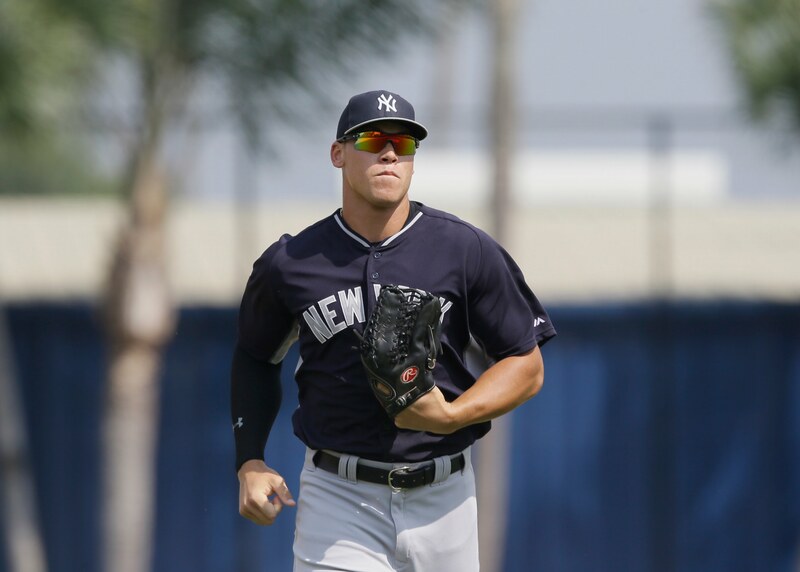 For more information on the three players, Gleyber Torres, Billy McKinney and Rashad Crawford, click on my post found here. Crawford and Torres will be heading for Class A Tampa while McKinney will be playing for the Double A Trenton Thunder. Now, let’s take a look at some more happenings down on the farm. One of Torres’ and Crawford’s teammate at Tampa will be right-handed pitcher Domingo Acevedo. The 6-foot-7, 190 pound Acevedo got the call up from Class A Charleston in the middle of June. His overall numbers are outstanding tempered by the fact he is still adjusting to a higher level. In 15 starts this season, the 22-year old Acevedo has thrown a total of 82 2/3 innings, striking out 92 while walking only 18. For Tampa, he has made seven starts and has registered a respectable 3.60 ERA, striking out 45 batters in 40 innings. His best outing came on June 27th when he threw seven shutout innings, allowing only five hits and no walks while fanning six. In his next start, Acevedo whiffed a season-high 12 batters over six innings of two-run ball. Ranked as the team’s #9 prospect, he was signed by the organization from the Dominican Republic in 2012. One spot above Acevedo in the organizational rankings is center fielder Dustin Fowler who plays for Trenton. The team’s 18th round selection in 2013 from West Laurens High School in Dexter, Georgia, the 21-year old Fowler leads the Thunder in several offensive categories including RBI’s, doubles and hits. His 108 hits places him third and his 55 RBI’s and 23 doubles ranks him eighth among all Eastern League hitters. Fowler has 13 hits in his last 39 at-bats, good for a .333 average. He also can run with 30 stolen bases in 2015 and 19 so far this season. The left-handed hitter makes solid contact but does not really walk. In 385 at-bats in 2016, Fowler has received only 17 free passes. However, as long has he can continue to stroke, a lack of walks will not be an issue. The Pulaski Yankees of the Rookie League Appalachian League have gotten off to a slow start. They are 15-17 and in last place but 4 1/2 games out of first in the league’s East division. Pulaski is the current home of Blake Rutherford, the Yanks’ first round pick this year. The 19-year old outfielder is off to a nice start, batting .310 and owns 13 hits in his last 38 at-bats. As a team, Pulaksi is struggling with a league-worst .246 batting average and a .329 on-base percentage that ranks eighth in the ten team league. However, the Yankees are showing some pop with a collective 27 home runs, third most in the league. On the mound, the numbers are slightly better. The pitching staff is seventh in ERA at 4.62 and WHIP (Walks plus Hits per Innings Pitched) at 1.39 and their 237 strikeouts are good for seventh. Over the last year, the New York Mets have dipped into their Minor League system quite a bit. They have promoted promising outfielders Michael Conforto and Brandon Nimmo and have dealt away promising prospects such as Michael Fulmer in order to improve the Major League roster. It is safe to say other than the shuttling back and forth of relievers from Triple A Las Vegas, the Mets will not be touching players on the farm in order to swing more deals. In order to deal a prized player such as shortstop Amed Rosario, New York would be looking for a sizeable return that is under club control for at least the next two seasons. The Las Vegas 51’s came into their All-Star Break with a record of 46-43, good for second place and 6 1/2 games behind the El Paso Chihuahuas. They dropped three consecutive games heading into the break and owned a mark of 4-6 in July. The 51’s are sending three players to the Triple A All-Star Game which will be played Wednesday night: third baseman T.J. Rivera, designated hitter Travis Taijeron and starting pitcher Gabriel Ynoa. Taijeron participated in the AAA Home Run Derby but was eliminated in the first round. With a record of 39-49, the Double A Binghamton Mets haven’t had a lot to cheer for. One of the bright spots in the team is second baseman Derrik Gibson who was signed by the organization last November. In his last ten games, the 26-year old Gibson has 14 hits in 35 at-bats, a .400 average. He was originally selected in the second round of the 2008 Draft out of Seaford High School in Seaford, Delaware by the Boston Red Sox. The 26-year old Gibson spent seven seasons in their organization, rising as high as the Triple A level in 2014. For the B-Mets, the right-swinging Gibson is hitting .283 and owns a .366 on-base percentage with eight stolen bases, both club-highs. 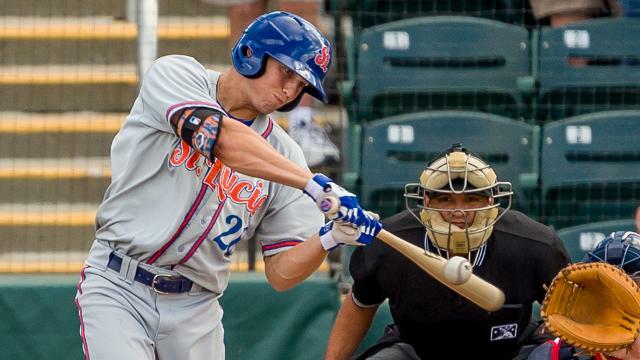 Ricky Knapp of the St. Lucie Mets continues to shine in the Florida State League. His 2.08 ERA is second-best among all Sunshine State pitching and he also owns a 1.11 WHIP (Walks plus Hits per Innings Pitched). The 24-year old Knapp, taken in the eighth round of the 2013 out of Florida Gulf Coast, is 7-4 in 90 2/3 innings over 14 total appearances, 13 of which were starts. The right-handed pitcher made one start for the B-Mets on July 2nd, hurling seven innings of two-run ball in a 9-2 Mets’ victory. In three of his 13 starts, Knapp has allowed zero runs, pitching a total of 22 innings in those outings. 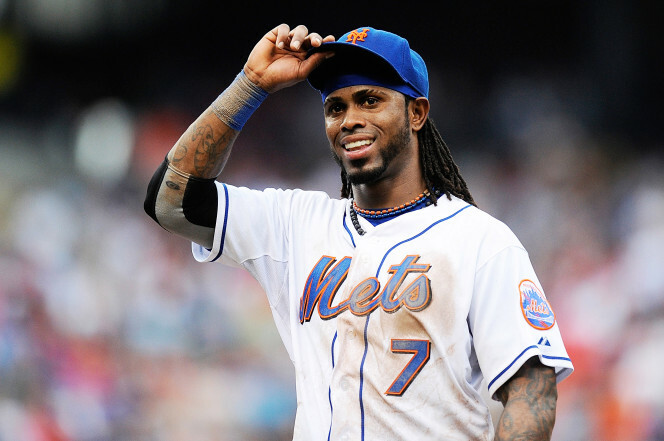 Jose Reyes is now officially back in a New York Mets’ uniform. Along the way, he stopped in a couple of farm teams in order to get back into Major League shape. He went hitless in six plate appearances for the Class A Brooklyn Cyclones and had six hits in 31 plate appearances for the Double A Binghamton Mets. This was the big story coming out of the Mets’ farm system over the past week along with the usual comings and goings at Triple A Las Vegas. On to some more action within the Mets’ Minor League organization. T.J. Rivera continues to hit for Triple A Las Vegas. Only July 4th, the Bronx native lit some fireworks of his own with a grand slam and six RBI’s as the 51’s defeated the Salt Lake Bees by a score of 17-6. The 27-year old shortstop is second among all Pacific Coast League hitters with a .351 batting average and is tied for fourth in RBI’s with 59. He was also selected to play in the AAA All-Star Game to be held on July 13th in Charlotte, North Carolina. Despite his gaudy production, the Mets seem to have no room for Rivera on their Major League roster. However, look for him to be part of the wave of September 1st call-ups. First baseman/outfielder Kevin Taylor of the Class A St. Lucie Mets was named the Florida State League Player of the Week for the week of June 27th-July 3rd. He had 13 hits in 31 at-bats with 11 RBI’s, two doubles, two home runs and seven runs scored. The 24-year old Taylor leads the Mets with seven home runs and 34 RBI’s and is tied for first among all FSL batters with a .396 OBP. He was originally taken in the 34th round by the Los Angeles Dodgers in 2011 out of Western Nevada College. After not advancing past the Single A Midwest League ranks in the Dodgers’ chain, Taylor found himself playing two years of Independent ball before the Mets signed him in February. The Single A Brooklyn Cyclones have rebounded nicely after a slow start. They are 6-4 over their last ten games, moving their record up to 9-10 and in second place in the New York-Penn League’s McNamara division. It’s been a mixed bag both on the mound and at the dish for the Cyclones. The pitching staff ranks first in strikeouts with 203 and tied for third in WHIP at 1.15 but eighth in ERA at 3.21. The offense ranks ninth in batting average at .225 and ninth in OBP at .307. However, they are in the upper half of the league in runs scored with 82. It will be an interstate rivalry weekend as the Hudson Valley Renegades make their way to Coney Island this weekend for a three game set against Brooklyn. 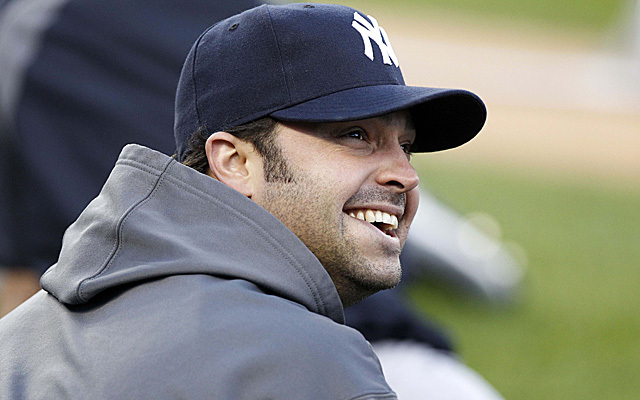 A big story last week with the New York Yankees’ Minor League system revolved around Nick Swisher. The veteran outfielder/first baseman opted out of his Minor League deal to be with his wife, actress Joanna Garcia Swisher as the couple welcomed the birth of their daughter, Sailor. The 35-year old Swisher hit .255 with a .297 OBP in 55 games for the Triple A Scranton Wilkes-Barre Railriders. 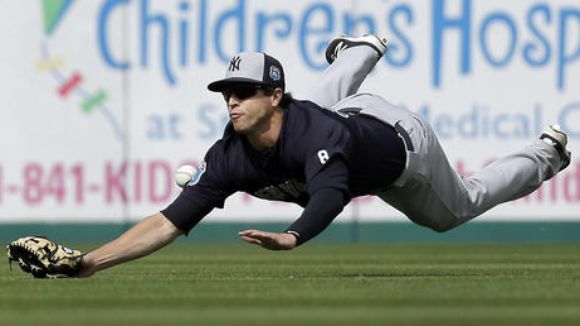 With all of the first basemen woes for the Yankees earlier this season, you would have thought Swisher would have been in New York at some point. I suppose management feels he has next-to-nothing left. Despite this, Swisher has vowed that he will be looking for a place to play in 2017. We congratulate him and his family on their new addition. Now for some on-field action within the Yankee organization. The Trenton Tunder of the Double A Eastern League have had quite the season. They own a mark of 53-32, second best in the 12 team league. However, they are in the unfortunate position of playing in the same division as the team with the best record, the Reading Fightin’ Phils who are 61-24. Trenton owns the top spot in the pitching categories, leading all Eastern teams in ERA at 3.04, strikeouts with 715 and WHIP (Walks plus Hits per Innings Pitched) at 1.22. Their bats aren’t too shabby, either, placing fifth in both batting average at .258 and on-base percentage (OBP) at .329. One of the newest members of the Thunder is 21-year old third baseman Miguel Andujar, who was promoted from Class A Tampa in mid-June. Andujar, who was signed as an international free agent by the Yanks in 2011, hasn’t let the higher caliber of play slow him down. He is hitting .342 with a .372 OBP in 73 at-bats with Trenton. He hasn’t stopped producing runs, either as he already owns 17 RBI’s in 20 games, this after ranking among the Florida State League leaders with ten homers and 41 RBI’s. Andujar is currently ranked as New York’s 14th-best prospect according to mlb.com. The Class A Charleston River Dogs have gotten off to a lackluster start after capturing the first half of the division title of the South Atlantic League. However, center fielder Jeff Hendrix has only begun to heat up. The team’s fourth round selection out of Oregon St. last year, the 22-year old Hendrix is now hitting .299, a tremendous improvement over the .247 he was hitting on June 1st. He has 15 hits over his last 35 a-bats, a span covering ten games. His .394 OBP ranks seventh among all South Atlantic League hitters. The Tampa Yankees of the Florida State League are heading to the playoffs. I know, it’s a bit early for that kind of talk but by virtue of them winning the first half of their division, they have assured the Yankees’ organization of at least one of their teams playing for a title. The question is, will super prospect Jorge Mateo be with the club come playoff time? The team’s #1 prospect is enjoying a solid campaign, hitting .270 with a league-leading eight triples. Don’t be surprised if the 21-year old Mateo moves up to Double A ball within the next month. Here are some other doings down on the farm. -Right-handed pitcher Chad Green continues to make a case to re-join the Yankees’ staff. The 25-year old Green, who made two appearances for the Bombers earlier this season, is sporting a 1.54 ERA for Triple A Scranton Wilkes-Barre. He has struck out 82 batters in 81 2/3 innings and has a WHIP (Walks plus Hits per Innings Pitched) of 0.98. Green’s ERA is tops in the International League while his WHIP is third-best. In his last outing, he allowed only three hits and one walk while striking out six over six shutout innings. -Speaking of Scranton, the Railriders own the International League’s best record at 47-32. However, their lead in the North Division is only a single game thanks to the Rochester Red Wings, the top farm club of the Minnesota Twins. Scranton is a well-balanced club, among the league leaders in team hitting and pitching categories. They are hitting a collective .263 with an OBP of .330, both tops in the 14 team league. On the mound, they own the best ERA at 3.13 and have allowed a league-low 610 hits. The staff ranks second in strikeouts with 638 and is second in WHIP at 1.21. -Two Yankees’ Minor Leaguers will be showcased in the Futures Game to played during All-Star weekend. Mateo and catcher Gary Sanchez, arguably the organization’s top two prospects, were named to the World squad. Mateo is having an outstanding campaign with eight triples and 26 stolen bases for Tampa and should be promoted to Trenton before the end of the Summer. 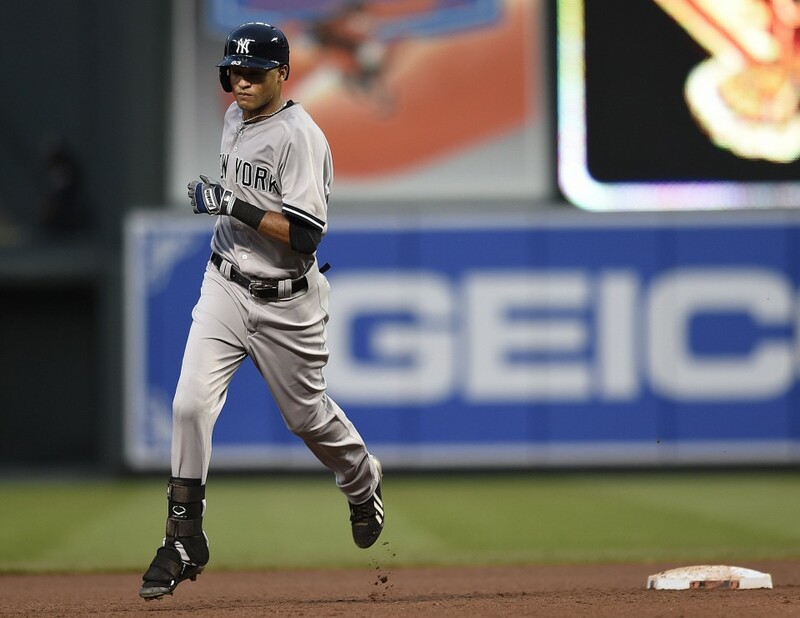 Sanchez had a brief call-up to New York earlier this year and is hitting .280 with eight home runs and 32 RBI’s. Sanchez played in last year’s contest, smacking a double. 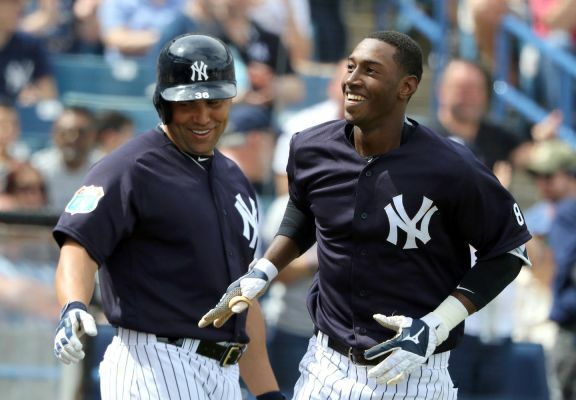 -The Single A Staten Island Yankees have gotten off to a blistering start. The team is 10-2, highlighted by a combined ten inning no-hitter by Drew Finley and Josh Roeder. This came one day after they opened the season by outlasting the Brooklyn Cyclones 3-2 in 20 innings. The Yanks are getting it done on the mound, placing second in strikeouts with 125 and second in WHIP at 1.03 in the 14 team New York-Penn League. First baseman Kane Sweeney, the Yanks’ 29th round selection in 2015, has 14 hits in 35 at-bats, good for a .400 average. The Minor League system for the New York Mets has seen quite a bit of action from some prominent Major Leaguers. Brandon Nimmo switched places with Michael Conforto as the former was called up to make his Major League debut while the latter was sent to Triple A Las Vegas to get himself worked out of a horrific slump. Most interesting of all was the return of Jose Reyes, who has begun his second stint in New York with a couple of games with the Brooklyn Cyclones. 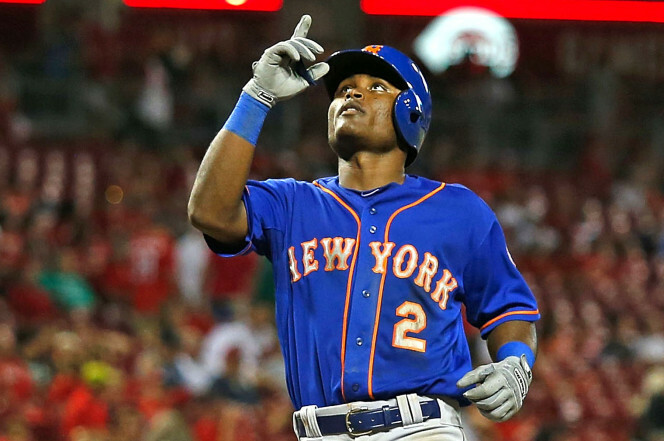 By the end of this week, there is a good chance that Reyes will make his return to Citi Field. Here are some other happenings down on the farm. –Per Marc Craig at Newsday (via mlbtraderumors.com), the Mets have no interest in trading shortstop prospect Amed Rosario. The 20-year old Rosario was recently promoted to Double A Binghamton after hitting .309 with a .359 on-base percentage at St. Lucie of the Florida State League. He would be the centerpiece in any major trade New York would make at the deadline but is deemed almost untouchable. -Another shortstop, Brooklyn’s Colby Woodmansee is off to an excellent start. The team’s fifth round pick earlier this month, the 21-year old Woodmansee has 11 hits in his first 28 at-bats for the Cyclones. He played three seasons with the Sun Devils, slugging 47 extra-base hits and scoring 75 runs over the last two years. -A pair of Met Minor Leaguers will be playing in the MLB Futures Game during All-Star weekend. 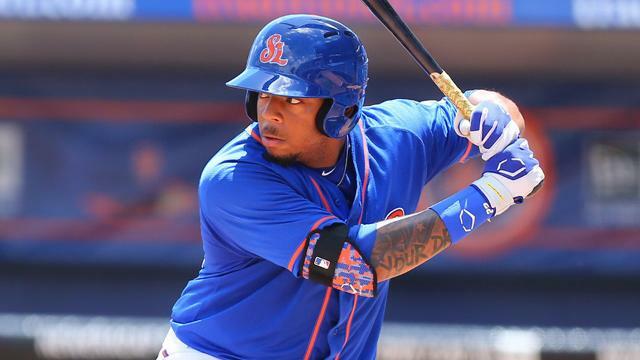 First baseman Dominic Smith will represent the United States while second baseman Dilson Herrera was placed on the World squad. The 21-year old Smith, ranked by mlb.com as New York’s #1 prospect, is hitting .259 with a .317 OBP and 48 RBI’s at Binghamton. The 22-year old Herrera is hitting .278 with 11 homers and 44 RBI’s at Las Vegas. -Speaking of Vegas, they own a mark of 41-37, good for second place in the Pacific Southern Division of the Pacific Coast League. They are 4.5 games off the pace set by the El Paso Chihuahuas, the top farm team of the San Diego Padres. Shortstop T.J. Rivera, second in the PCL with a .361 batting average, was just activated from the disabled list. In order to make room for Rivera, the 51’s released third baseman Danny Muno.